Oil medium; rich in oil/“fat”; retards drying; increases gloss. Oil medium; rich in resin/“lean”; accelerates drying; increases gloss. Oil medium; accelerates through drying of thicker oil layers; remains consistency. 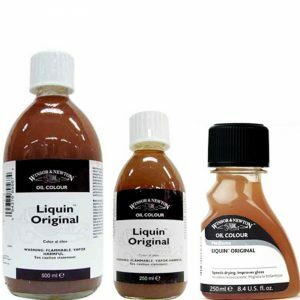 Oil medium; allows oil colours to be mixed with water instead of turpentine or turpentine substitute; increases gloss and transparency; harmonizes drying process; odourless. Final varnish for paintings in oil; glossy, non-yellowing, very elastic. Wetting agent for water-colours and gouache colours; optimizes the colours´ flow especially on greasy surfaces. Purified oil of turpentine. Clear; low-resinous. 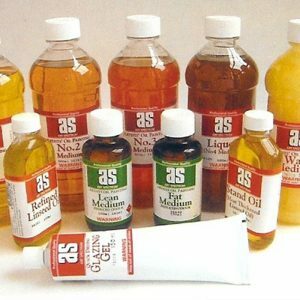 Thinner for oil colours, oil painting mediums and varnishes based on mineral spirit; not mixable with varnishes based on alcohol; solvent for dammar resin and mastic resin. Cleaning agent for painting tools. Technique: oil, resins, varnishes (based on mineral spirit). 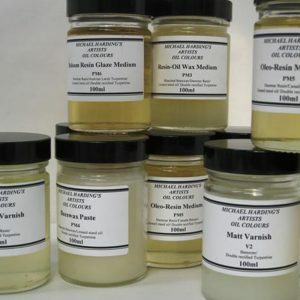 Michael Harding offers a range of traditional mediums, oils and diluents. Oil Paint Medium is a basic paint medium designed to ease flow and increase gloss, transparency, depth and beauty of the pigment colour. This medium is a linseed stand oil, turpentine, formulation that prevents yellowing of paint film. A traditional glaze medium that helps to adds depth and gloss to transparent colours. Dammar Glaze Medium in known for its speedy drying time of oil colours; use with slower-drying colours. Resin Oil Wax Medium is a soft painting paste, derived from pure bleached beeswax then mixed with dammar resin and linseed stand oil. This popular medium creates a satin sheen and gentle impasto in paint layers. Settling of the medium may occur so allow jar to stand in hot water and stir contents until dissolved. Beeswax Paste is a high oil content paste based on linseed stand oil and pure bleached beeswax. This paste increases the body of oil colour with satin-matt finish which is especially useful with opaque colours. Oleo Resin Medium is a historic glaze medium based on light coloured Canada balsam fused with dammar resin and linseed stand oil. This versatile medium provides high gloss levels while imparting depth to paint films. Another historic paint medium, based on Austrian larch turpentine (Venice turpentine) made with Dammar resin and linseed stand oil. This wonderful smelling medium can be added to oil colours to enhance depth, gloss and lustre. 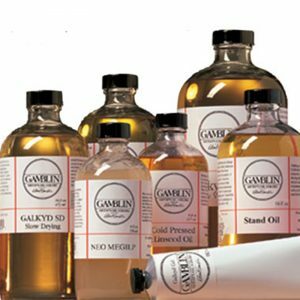 Gamblin’s family of Galkyd painting mediums and Cold Wax Medium are formulated with Gamsol. 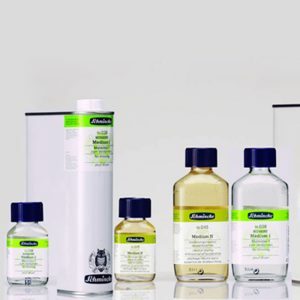 Galkyd Slow Dry is available in the following sizes: 4 oz, 8 oz, 16 oz. Solvent-Free Gel gives colors more flow and transparency, yet holds the shape of your brushmark. Solvent-Free Gel has a moderately fast drying rate and increases gloss. Made from safflower oil and alkyd resin, Gamblin Solvent-Free Gel is non-toxic and contains no Gamsol or petroleum distillates. 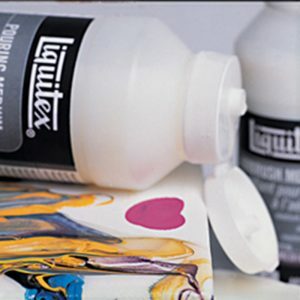 In comparison to other solvent-free mediums, Gamblin Solvent-Free Gel supports the broadest range of painting techniques with the least compromise across color, dry time, texture and mark-making. To ensure proper drying of paint layers, Solvent-Free Gel should be used in moderation with oil colors. No more than 25% by volume. To avoid wrinkling, apply mixtures of Solvent-Free Gel and oil colors thinly. Painters who are using more than 1/3 cold wax medium to 2/3 oil paints should paint on rigid supports or paintings may crack when moved. By mixing 1/2 Cold Wax Medium and 1/2 G-Gel, painters can paint on flexible supports. Medium No. 2 is a fat medium. It contains more oil than Medium No. 1. It should be mixed with the oil paint as the layers of painting develop. It has some of the properties of a glazing medium but it is preferable to use Art Spectrum 24-hour Glazing Medium if very thin veils of colour are desired. 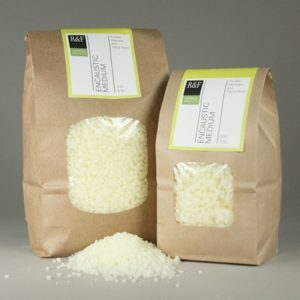 Our Impasto Modeling Wax is a blend of microcrystalline (petroleum) waxes and beeswax. It is designed for sculptural purposes. The Impasto Modeling Wax can be cast, carved, and layered to create a textural surface. Impasto is available in 333 ml cakes. The melting point of the impasto | modeling wax (175°F, 79°C) is a higher temperature than the melting point of encaustic (approximately 162°F, 72°C). The difference in temperature allows one to paint and fuse the encaustic over a shape without immediately blunting sculptural details or impasto effects. 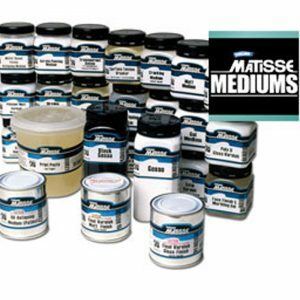 Matisse Painting Mediums are complementary products designed to make acrylic paint more versatile. They can be used with the Matisse Structure and Flow formulas, Matisse Inks and Matisse Background ranges and more. Slows drying time when added to Matisse paints. Provides high build relief when allowed to dry and then painted over with Matisse colours, or when mixed directly with the paint. Thins paint so that less water is required, keeping colours stronger. Ideal for Airbrush or Watercolour techniques. Dries clear or mixes with Matisse colours to give a 3D high-gloss glaze. Add to Matisse Colours to achieve a matte sheen/finish. Use as a final varnish or can be mixed with Matisse Colours. Non-yellowing matt finish. Use as a final varnish or can be mixed with Matisse Colours. Non-yellowing high gloss finish. Add to Matisse Colours to achieve washes and glazes. Use to increase binder content of Matisse Colours when reducing them with water. A full bodied permanent, flexible primer for use on canvas, paper, board or wood for paintings in acrylics or oils. Use for sealing very porous surfaces such as terracotta or as a tannin blocker for “green” wood. Conservation quality solvent-based non-yellowing acrylic gloss finish varnish. Redissolves in turps to strip and clean or to rework. Conservation quality solvent-based non-yellowing acrylic matt finish varnish. Redissolves in turps to strip and clean or to rework. Water-based polyurethane varnish with a non-yellowing hard wearing high gloss finish (for use on rigid surfaces only). Mix with Matisse Colours to achieve brilliant transparent prints when screen printing. Slows drying time and extends colour. A low viscosity alternative gesso for artists who want to brush straight from the jar. Use as a final varnish or can be mixed with Matisse Colours. Non-yellowing satin finish. Conservation-quality solvent-based non-yellowing acrylic satin finish varnish. Redissolves in turps to strip and clean or to rework. All the valued qualities of Derivan’s original Matisse Gel Medium, now in a matt finish. Extends the “open” or “working” time of acrylics without affecting consistency. A modelling compound with a lighter body and finish. Build relief and texture without the constrains of weight. Non-yellowing acrylic resin varnish containing UV inhibitors. Final clear gloss finish. Recommended ground for encaustic work or as a soft or oil pastel primer. High tooth finish. Permanent. Additive that creates smooth, glossy finishes with minimal surface texture.